Former Major League pitcher and mental skills coach for two of baseball's legendary franchises (the Boston Red Sox and San Francisco Giants) Bob Tewksbury takes fans inside the psychology of baseball. 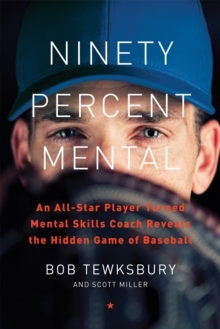 In Ninety Percent Mental, Bob Tewksbury shows readers a side of the game only he can provide, given his singular background as both a longtime MLB pitcher and a mental skills coach for two of the sport's most fabled franchises, the Boston Red Sox and San Francisco Giants. Fans watching the game on television or even at the stadium don't have access to the mind games a pitcher must play in order to get through an at-bat, an inning, a game. Tewksbury explores the fascinating psychology behind baseball, such as how players use techniques of imagery, self-awareness, and strategic thinking to maximize performance, and how a pitcher's strategy changes throughout a game. He also offers an in-depth look into some of baseball's most monumental moments and intimate anecdotes from a "who's who" of the game, including legendary players who Tewksbury played with and against (such as Mark McGwire, Craig Biggio, and Greg Maddux), game-changing managers and executives (Joe Torre, Bruce Bochy, Brian Sabean), and current star players (Jon Lester, Anthony Rizzo, Andrew Miller, Rich Hill). With Tewksbury's esoteric knowledge as a thinking-fan's player and his expertise as a "baseball whisperer", this entertaining book is perfect for any fan who wants to see the game in a way he or she has never seen it before. Ninety Percent Mental will deliver an unprecedented look at the mound games and mind games of Major League Baseball.